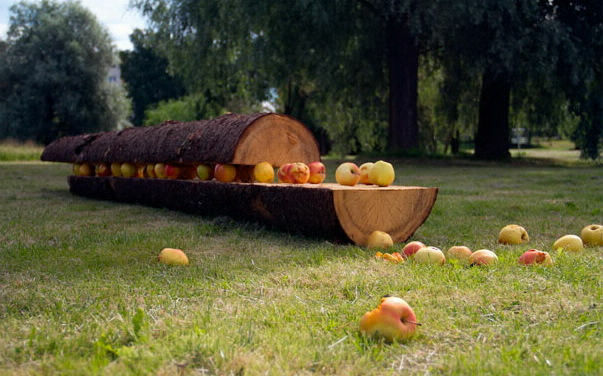 A tree trunk sawn in two parts, with apples placed in-between them lies on the ground. The work, entitled The Border, by Russian artist Sergey Karev, could in its execution seem simple, but holds several levels of interpretation. The use of organic materials causes the work to change during the exhibition, making it a living object impossible to predict how it will appear at the end of the three weeks. It is a temporary sculpture, as changeable as our physical surroundings and our political society. The multifold title The Border refers both to national, ever-changing borders, and according to the artist, the inner borders (common sense, personal behaviour, stereotypes, and so forth). In the context of the geographical location of Võru, the work more specifically also refers to the Setomaa region. This region, historically home to the ethnic and linguistic minority of the Seto people, was divided by the independence of Estonia for the first time between two countries – Estonia and Russia.